Visit a local community cooperative near Ranthambhore Tiger Reserve – See the work they do to support tiger conservation. Spend 2 days with a local NGO in Assam that works with the local community and the forest department supporting conservation of the endangered one horned in Kaziranga and Manas Tiger National Park. As a Member of TOFT (Travel Operators for Tigers) Mantra Wild Adventures is a sponsor for the Village Wildlife Watcher Programme. The Village Wildlife Watcher programme is a joint initiative from Dec 2014 with Tiger Watch, The Rajasthan Forest Department and many village communities bordering the park, funded by TOFTigers travel partners, which is helping protect the eastern borders of Ranthambhore tiger reserve, through employment of Village Wildlife Watchers (VWW) as eyes and ears for the Field Director on the fringes of the park. 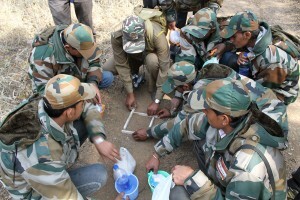 They helped in a week long period to manage traffic in the area where a tigress with 2 cubs were stationed near a small town. They informed about 10 different poaching related information in the area. 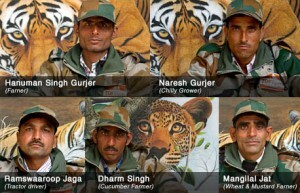 They also captured a poacher’s picture from the same path used by the tiger just before one and half hours. They captured 4 times caracal, one rusty spotted cat and a wolf in the camera traps, which are all very rare species. Regular movement of peripheral tigers is now monitored well by these Village Wildlife Watchers.